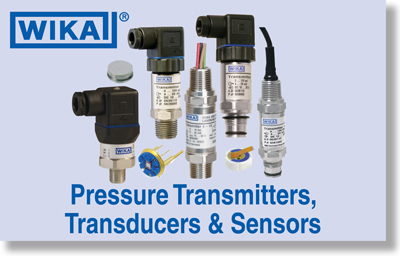 WIKA transmitters and transducers are designed for long term, reliable performance in difficult industrial environments. Most models feature stainless steel construction, moisture, and vibration protected circuitry, and all are calibrated and tested prior to shipment. A variety of options are available on most models to meet specific needs. Digital panel meters and controllers are user programmable to display pressure in any desired engineering units. They are available with a variety of options including dual programmable relays for alarm or control applications.